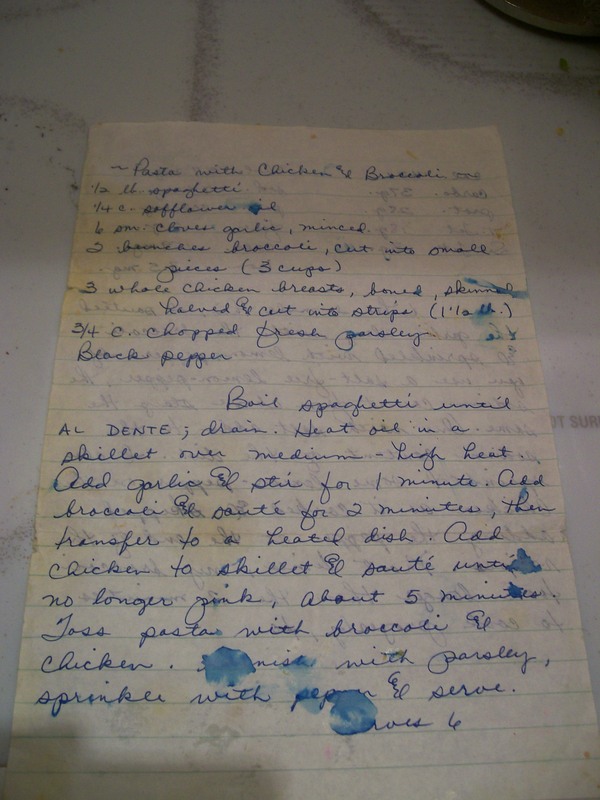 As a young Cook starting out in the kitchen, I was given a recipe from Mom that has stayed with me ever since. We made it together once, and she wrote it down for me. The original recipe she wrote out was not exactly what we cooked together. I think this must have been the beginning of the end of following recipes “to the letter” for me. Over the years this recipe has served me well as a quick, “throw it together at the last minute” meal, and it is also a “company worthy” meal, especially if paired with a nice salad. What started in my kitchen as simply “Pasta with Chicken & Broccoli”, has evolved into something that I still call “Chicken & Broccoli”, and yet, it is a rare occassion that broccoli is the only vegetable in the pan/on the plate. Tonight’s version included nearly 2 heads of garlic (much more than the 6 small cloves called for in the original recipe), carrots, cauliflower, broccoli, chicken, and angel hair pasta. Amounts? You got me! I have no idea, except that all of it together more than filled my very large Stir Fry Skillet and will provide leftovers for dinners and lunches this week. Boil spaghetti until AL DENTE; drain. Heat oil in a skillet over medium-high heat. Add garlic and stir for 1 minute. Add broccoli and sauté for 2 minutes, then transfer to a heated dish. Add chicken to skillet and sauté until no longer pink, about 5 minutes. Toss pasta with broccoli and chicken. Garnish with parsley, sprinkle with pepper and serve. When I made this, I sautéed the garlic along with the broccoli and sprinkled with lemon-pepper. If you use a salt-free lemon pepper, the sodium count from above stays the same. One with salt adds to the sodium content of the dish. I also sprinkled some lemon-pepper on the chicken as it cooked and skipped adding the pepper at the end of the recipe. Most times, my broccoli took longer than the 2 minutes to cook properly, too. For years I have posted online with a group of women. We are bonded together by our love of cooking, but our relationships have grown to be so much more than that. This is where the above recipe was in it’s evolution stage when I was still pretty new to online groups, and this is how I shared my recipe at that time. In a large skillett cook broccoli until crisp-tender, chicken until done. cook each with as much garlic as you like (we use A LOT!!) cook pasta, toss all together. I sometimes add a little parsley, and lemon pepper. it’s fast and easy, total of about 15-20 minutes. I put soy sauce and parmesan cheese on the table, and everyone picks their own topping. Serve with Garlic Toast (or Garlic Cheese Bread) and salad. Fully grown now, and this is the first time I’ve looked at this recipe in, well, I don’t know how long. I wasn’t even sure I’d still have the original copy from Mom. And tonight, I made my much-loved “Chicken & Broccoli”. It was really just my way of using up the vegetables in the fridge that were in need of cooking and taking up my valuable fridge space. Yes, tonight, it was as my recipe above states, except that I used nearly 2 heads of garlic, and added to the pan a head of cauliflower and several carrots. I have been known to include mushrooms and/or zucchini, and any other stray vegetables that may be laying around, just wanting to be added to a sizzling pan of oil and garlic and tossed with pasta. I have discovered that freshly grated/shredded parmesan is better than the powdery stuff from a can. (Although, I do prefer the powdery stuff from a can when making my garlic toast. A little garlicky butter spread on french bread, and sprinkled with that and then broiled until brown… it’s like a slice of heaven that reminds me of spaghetti dinners from my childhood!) I have served this up to many people, and everyone tops it differently. For a friend who likes spicy food, he would add chili paste to his portion. My kids eat it just as it is, no toppings. I like fresh parmesan *and* soy sauce sprinkled on mine. If you start the water for pasta at the same time you start the cutting and slicing and dicing, you should be eating dinner by the time the pasta is finished cooking, if you’re using angel hair pasta, that is. I definitely prefer this with angel hair pasta! I cook this now with extra virgin olive oil, and the pasta gets coated with a generous amount of same to keep it from sticking together in one big clump. Cook ground beef and onion till meat is lightly browned. Season with salt and pepper to taste. Add tomatoes, water, rice & worcestershire sauce. Cover and simmer till rice is tender, about 15 minutes. Stir in cheese, shredded (about 1 c) Stuff peppers; stand upright in baking dish. Bake uncovered at 350°F for 20-25 minutes. I love this dinner! I like to add baked potatoes and a salad to finish it off, and some fresh baked bread! If you know the next day is going to be busy and you may not have time to get dinner together, this is a great one to do. Make it up the night before and put it in the fridge. Add just a couple extra minutes onto the cooking time! I often make life easier for myself and cook up a large amount of rice on a weekend for use throughout the week. Then I’ll just use a few big scoops of the already cooked rice, omitting the extra water in the recipe. I’ve also been known to skip the canned tomatoes and chop up the tomatoes that are sitting on the counter, begging to be used. Admittedly, I don’t follow this (or most) recipe exactly. I add things all the time, or change it here and there. But this is the basic recipe and a good starting point for budding cooks. I am just back from a wonderfully relaxing weekend at the beach with some of my favorite people! 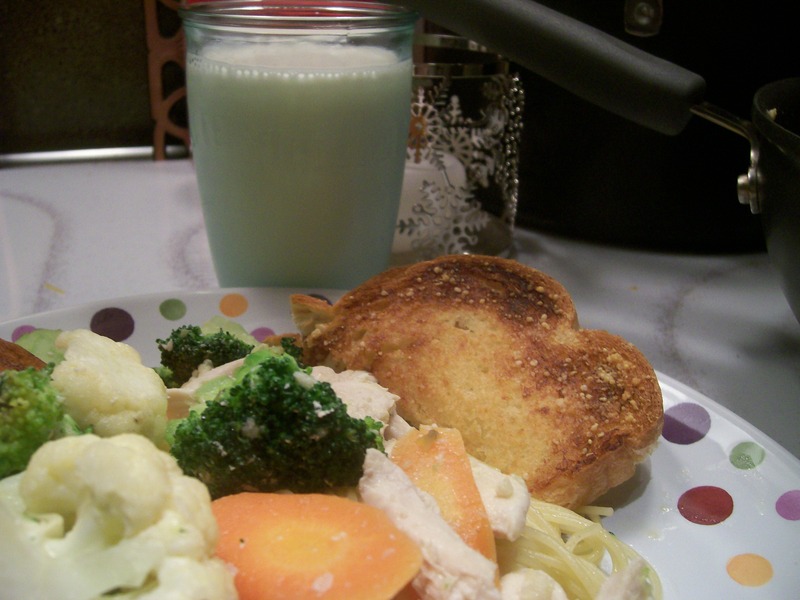 While there, I made dinner one night for everyone (Does that surprise you? I’m at the beach and I wanted to cook for my friends…) So… one of my favorite summer meals is Jerk Chicken Salad. It is simple and versatile. The recipe is from The Pampered Chef and calls for serving with romaine lettuce. 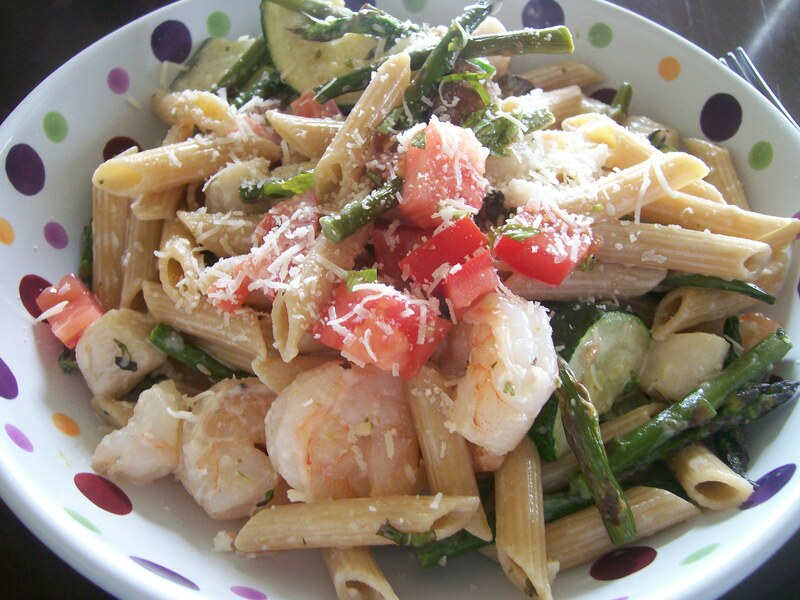 You’ll see in the Cook’s Tips at the end of the recipe that you can serve with pasta instead, which is what I prefer. On this occasion, however, we had a friend with a wheat allergy, so stuck with the lettuce version. When I do this at home, I like to use whole wheat rotini (corkscrew) pasta and then the leftovers are quite good served cold for lunch the next day. In Classic Batter Bowl, whisk together oil and jerk rub with Stainless Whisk. Add chicken tenders; mix well to coat and set aside. Peel pineapple and cut in half lengthwise with Santoku Knife; reserve half for another use. Cut remaining pineapple in half lengthwise and remove core. Slice crosswise into ¼-inch slices. Heat Grill Pan over medium heat 5 minutes. Add chicken; cook 3-5 minutes on each side, turning once. Remove from pan. Add pineapple to pan. Cook 1 minute on each side, turning once; remove from pan. Cut chicken into bite-size pieces using Utility Knife; set chicken and pineapple aside. Thinly slice bell pepper and green onions on Cutting Board with Measure Cups using Santoku Knife. Arrange 12 large lettuce leaves around Simple Additions® Large Round Platter. Chop remaining lettuce; set vegetables aside. Drain and rinse beans using Strainer; set aside. For dressing, zest one lime using Microplane® Adjustable Grater. Juice both limes into Small Batter Bowl using Citrus Press. Add lime zest, mayonnaise and pineapple preserves to batter bowl; mix well. Layer chopped lettuce, beans, bell pepper, chicken, pineapple, bacon and green onions over each lettuce leaf. Drizzle dressing over salad. Cook’s Tip: If desired, 1 pound of boneless, skinless chicken breast halves, cut into strips, can be substituted for the chicken tenders. To microwave bacon, line Medium Bar Pan with sheet of Parchment Paper. Arrange bacon slices in a single layer on bar pan; cover with another sheet of Parchment Paper. Microwave on HIGH 4-6 minutes, checking after each 30-second interval and turning once with Bamboo Tongs. Remove bacon to paper towel-lined plate to drain. For a kid-friendly version of this recipe, prepare recipe as directed, omitting lettuce. Cook 1 pound rotini pasta according to package directions. Drain pasta and toss with 2 tablespoons vegetable oil. Add remaining ingredients; drizzle with dressing and toss gently. I’m in “stop spend” mode right now. I go through these cycles of buying too much food… and when I realize I can no longer fit anything else into the pantry and/or freezer (and often refrigerator), I put the family on “stop spend” and then we take stock of our food and create our menus using only what we have in the house, going to the grocery store for only milk, bread and possibly some fresh produce. So… what does a “stop spend” menu look like, and is it really possible to create a full week of meals without going to the store?! Keep reading this week to see what we create from our “stock on-hand”. For those of you that did not follow my previous blog, you may be wondering if it’s really possible to have that much food in the house, and really not need to go shopping for a whole week. Let me tell ya… I’ve done this challenge in the past for 2 weeks and longer! It’s an awful, wonderful thing, my love of all things food! Toss all this together for creamy goodness! Serve with a salad and/or garlic toast, if desired. I like this with whatever vegetables I happen to have on-hand, and usually don’t add any kind of meat. I compromised with the family and added the shrimp & scallops this time… but next time, it will be a perfect “Meatless Monday” kinda meal!